President Barack Obama has said he has not yet decided on Syria strike. However, the president said he had concluded Syrian government forces were behind a recent chemical weapons attack near Damascus. Speaking on US television, Barack Obama said the use of chemical weapons affected US national interests and that sending a “shot across the bows” could have a positive impact on Syria’s war. Meanwhile the UK had been pushing for permanent members of the UN Security Council to adopt a resolution which would have authorized measures to protect civilians in Syria. But Syrian ally Russia refused to agree to the resolution and the meeting produced no end to the diplomatic stalemate which has long characterized the UN position on Syria. The US State Department criticized “Russian intransigence” and said it could not allow diplomatic paralysis to serve as a shield for the Syrian leadership. The ships are being sent to strengthen the navy’s presence in the area because of the “well-known situation” there, the Russian news agency Interfax has said. Critics have questioned what purpose a limited strike on Syria could serve, but Barack Obama told the Public Broadcasting Service (PBS) it would send the government of Bashar al-Assad “a pretty strong signal that it better not [use chemical weapons] again”. The US has yet to produce the intelligence it says shows Bashar al-Assad’s government is guilty of using chemical weapons, and UN weapons inspectors are still investigating inside Syria. The team has just begun a third day of on-site investigations, and UN Secretary General Ban Ki-moon has appealed for it to be “given time to do its job”. He said the inspectors would finish their investigations and be out of the area by Saturday morning. Syria denies using chemical weapons and blames opposition fighters for the attack near Damascus on August 21, which reportedly killed hundreds of people. It accused the West of “inventing” excuses to launch a strike. In a sign of growing fears about an impending attack among Syrians, the Associated Press quoted Lebanese officials as saying at least 6,000 Syrians crossed into Lebanon in a 24-hour period through the main Masnaa crossing – compared to a normal daily tally of between 500 and 1,000 refugees. In Damascus senior military commanders are reportedly staying away from buildings thought likely to be targeted. 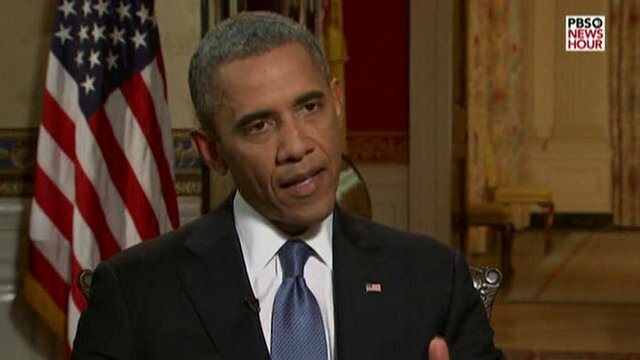 President Barack Obama told PBS that the US had “not yet made a decision, but the international norm against the use of chemical weapons needs to be kept in place, and hardly anyone disputes that chemical weapons were used in a large scale in Syria against civilian populations”. “We’ve looked at all the evidence, and we don’t believe the opposition possessed chemical weapons of that sort,” Barack Obama said. “There need to be international consequences, so we are consulting with our allies,” he said. There was “a prospect that chemical weapons could be directed at us – and we want to make sure that doesn’t happen”. In an open letter to the president, US House of Representatives Speaker John Boehner demanded he explain “the intended effect of military strikes”, and how he would prevent the intervention escalating, if he wanted to win public and congressional backing for action. More than 110 members of Congress have signed a letter formally requesting that Barack Obama seek congressional approval for any action in Syria. The US has said it will not take action alone – but one of its primary allies, the UK, has agreed to wait until UN inspectors report back before taking a parliamentary vote on potential action. The use of force without a sanction of the UN Security Council would be a “crude violation” of international law and “lead to the long-term destabilisation of the situation in the country and the region”, Sergei Lavrov has said. Kris Jenner's show canceled after six-week trial?